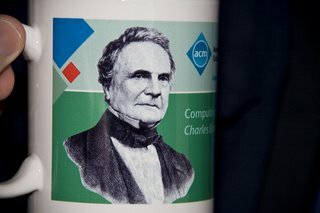 In recognition of my anniversary of belonging to the ACM, they sent me a mug with Charles Babbage's picture on it. I subsequently received an email asking me if I enjoyed the mug. I responded that it was a "great place to cache the output of my coffee engine!" Ha. Haha... HahahahhahhhahaaahhAHAHHAHHAHAHAAAHAH!